With the increasing popularity of GM's LS-series engine family, many enthusiasts are ready to rebuild. 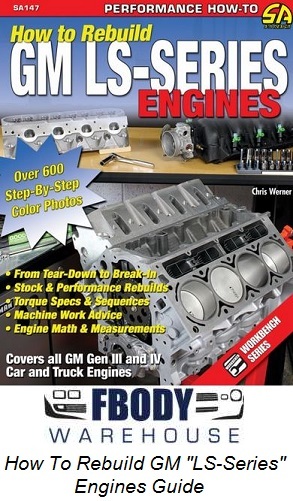 How to Rebuild GM LS-Series Engines is the first book of its kind to help you rebuild your GM LS-series engine. It explains variations between the various LS-series engines and elaborates upon the features that make this engine family such an excellent design. In this special Workbench book, author Chris Werner uses more than 600 photos, charts, and illustrations to give simple step-by-step instructions on disassembly, cleaning, machining tips, pre-assembly fitting, and final assembly. This book gives considerations for both stock and performance rebuilds. The book guides you through both the easy and tricky procedures, showing you how to rebuild your engine and ensure it is working perfectly. The book also illustrates many of the performance components, accessories, and upgrades that have been developed for the LS-series family of engines. As with all Workbench titles, this book details and highlights special components, tools, chemicals, and other accessories needed to get the job done right, the first time. Appendices are packed full of valuable reference information, and the book includes a Work-Along Sheet to help you record vital statistics and measurements along the way. You'll even find tips that will help you save money without compromising top-notch results.